Advantages: 49 color profiles of individual aircraft and three 1/72 scale drawings. Have you been keeping up with your study of Polish since my review of Polish Wings No. 4? I hope so, because Polish Wings No. 4 has landed on my desk and I am sure this will be of even more interest than the previous issue. Like Polish Wings No. 2, No. 4 focuses not on the airplane itself, but rather on the use of the aircraft by Polish pilots. In 1939, Britain agreed to take approximately 2,300 Polish airmen in exile. These airmen were incorporated into Royal Air Force Volunteer Reserve forming four bomber squadrons. With the fall of France, many more Polish airmen made their way to Britain, and an effort began to form a Polish Air Force in Britain. On 5 August 1940, an agreement was reached creating an independent Polish Air Force, although still subordinate to the RAF in many aspects. Polish Wings No. 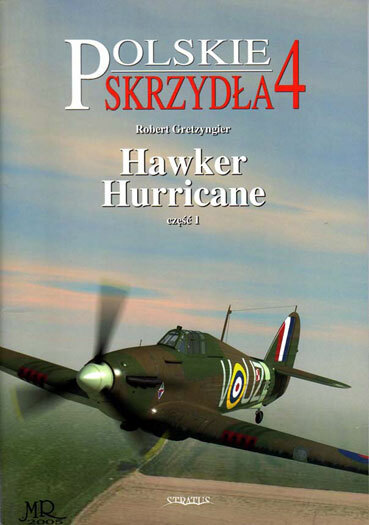 4 focus on seven RAF (Polish) Squadrons that flew the Hawker Hurricane. These were 302 (WX), 303 (RF), 306 (UZ), 308 (ZF), 315 (PK), 316 (SZ) and 317 (JH) Squadrons. Once again Polish Wings brings together exquisite profiles with the available pictures of the aircraft profiled. The pictures and profiles are all captioned, but only in Polish. For those who are particularly attuned to RAF marking and camouflage, one will notice that the illustrator attempts to represent the use of both the Sky and Sky Blue fuselage band. Of course it is an issue of interpreting black and white photos, but I believe he has made a good effort. In some pictures it seems quite clear that the band is much lighter than the underside color. In other pictures perhaps less so, leaving one with a virtual coin toss as to whether it was Sky or Sky Blue. The author presents a reference chart for each squadron that lists the aircraft’s assigned code and the serial number. The period covered is roughly from autumn 1940 through the end of 1941. They are quite clear, but one must remember that Roman numerals are used to indicate months in the Polish dating system. Finally, there are three 1/72, four-view line drawings. These cover the Mk. I, Mk. IIa and IIb Hurricanes. As was the case with Polish Wings No. 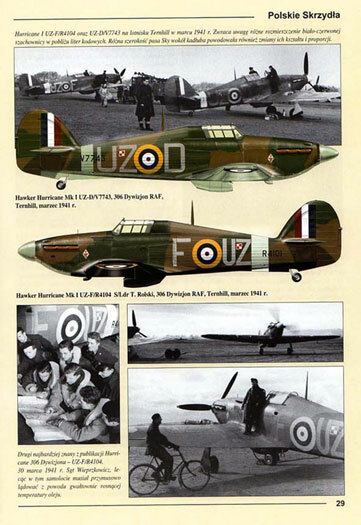 2, even if you do not read a word of Polish, this is an excellent picture and profile reference on the Hawker Hurricane as used by Polish airmen. Hopefully you will not have to continue your Polish language study much longer. According to Mushroom Model Publications, Polish Wings No. 5, Hawker Hurricane part 2, and No. 6, Supermarine Spitfire I/II, will be in English. I’m looking forward to both. Polish Air Force 1939-1945; Dr. Jan Koniarek; Squadron Signal Publications, 1994. Polish Aces of World War 2; Bobert Gretzyngier & Wojtek Matusiak; Osprey Publishing, 1998. White Eagles; Bartlomiej Belcarz & Robert Peczkowski; Hikoki, 2001.